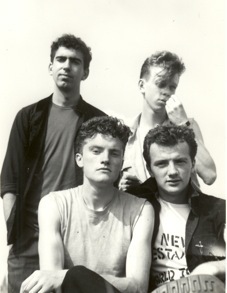 New Testament in 1983 with Steve Wall (front left) and Eamonn Dowd (back right). Formed early 1982 approx in Galway, New Testament (NT for short) were a Clash-inspired band ("London Calling" rather than the debut). Their 5-song demo was recorded in 1982 at RCF Studios and was mentioned in Hot Press in 1983. This was recorded with the original drummer and bass player (names?). Cormac Dunne became the drummer in 1983. Sammy Rohan (ex Index 4, who'd played on the same bill as NT at the Ivy Rooms in Dublin in July 1982) joined as bassist circa October 1983. All were students at UCG. The new lineup's first gig was at Smokey Joe's Cafe in UCG. They gigged throughout 1983, mainly in the West of Ireland. NT supported New Order at UCG on 23 April 1983 with another local band All Cats Are Grey. They were the subject of a short film shot that summer, which probably still exists on video somewhere. NT went back into the studio during the summer of 1983 to record two new tracks "Neutral Man" and "Mad House". A video was made for "Neutral Man" which still exists. 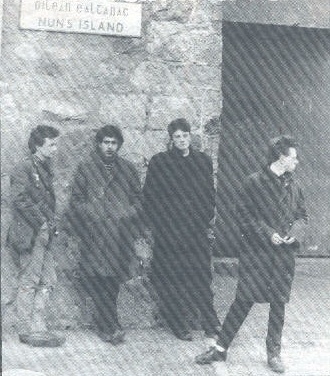 The band joined the Motion Club, a Galway-based dance club that put on events around Ireland and UK in the 1980s, and began touring with them. When Eamonn, Steve and Cormac graduated in the summer of 1984, they were ready to step up the action, but Sammy was unable to commit due to his studies, and he was replaced by Steve's brother Joe Wall on bass. The new lineup barely managed a gig before it split: Eamonn Dowd formed the Swinging Swine while Stephen & Joe Wall and Cormac Dunne formed The Stunning. Sammy Rohan went on to play with several other Galway bands: cowpunks The Saddle Sore Cowboys, the Máimín Cajun Band and rockabilly band The Screamin' Blue Cats.